We have some old-fashined perennial sweet peas (Lathyrus latifolius) in our back yard that have been growing here since shortly after our house was built in 1957. I remember them from when I was very, very young in the 1960s. If family history is correct, my Great Aunt Nettie (one of my two aunts who built it) brought them with her when they retired and moved home from Boston. They came from the garden of one of her “practical nurse” patients. If true, those same seeds have been coming back in the same spot – year after year – for the past 56 years. That’s what I call a self-seeding perennial. It’s always a welcome sight to see the familiar pea-like stems breaking the ground and starting their reach for the sky in mid spring. It's like a physical connection to my childhood. It’s interesting how nature, in all its diversity, seems to like certain forms and repeats them over and over again. A good example is the flower shape of sweet peas. It’s an unbelievably common shape, for all it’s beauty and uniqueness. It is borne on amazingly diverse plants, all seemingly unrelated unless you look them up. 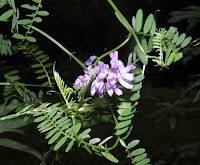 They’re all members of the very extended legume family, Fabaceae. It doesn’t take long to find examples. 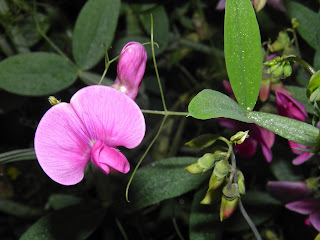 There is our Lathyrus, and just feet away in our vegetable garden we have its close look-alike, garden peas. We have been eating our peas for a little while now, but sadly that will be soon coming to an end. Another member we can find in our yard is a weed. 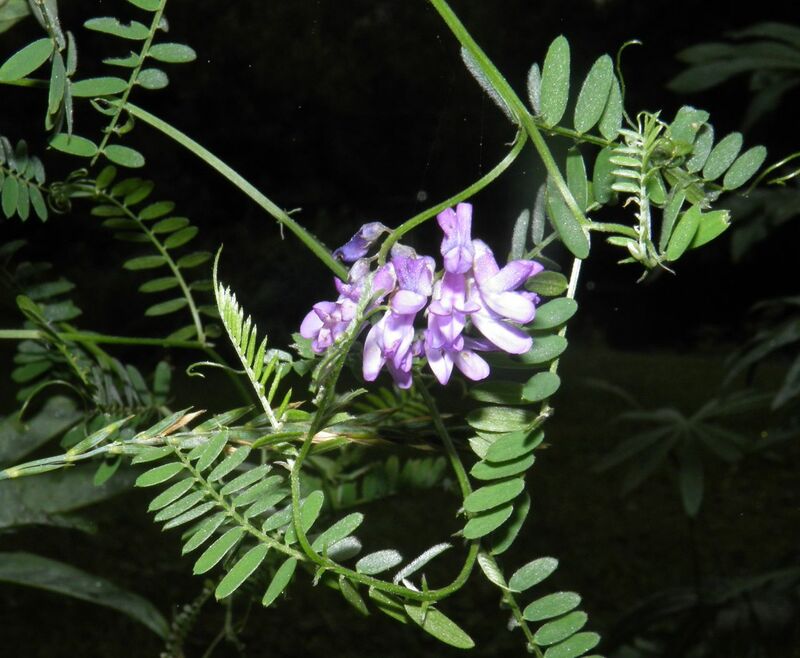 Vetch grows in ditches, fields and pretty much anywhere else it wants to. It is by far the most delicate looking of my examples. My memories of this plant go back to when elementary school used to close for the summer. It always used to be blooming at that time. Although historically used as food I have read conflicting information about toxcitity, so don’t pick yourself a bowl to eat. They’re really small, so it would take you quite a while anyway. 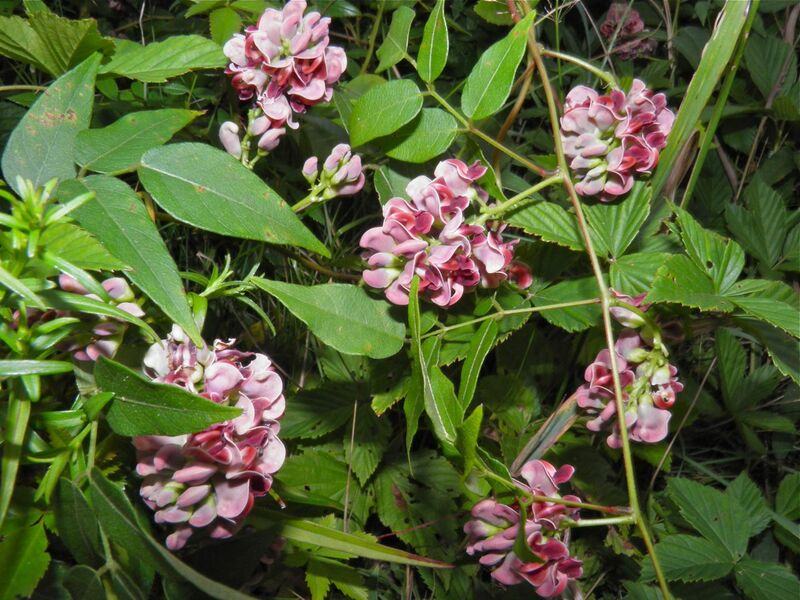 American Groundnut (Apios americana) is a vine in the village and is actually a food source. It grows along our riverbanks and is quite rampant. It has tight clusters of pea-like flowers in an interesting combination of maroon and oxblood. To me they smell like raspberry cheesecake ice cream! The flowers of groundnut. They should be in bloom soon. I’ve written twice about groundnuts, not for its flowers but for its use as a food. At the end of every vine is a tuber that natives used to harvest and eat as a valuable source of dietary starch. There’s also locust trees. 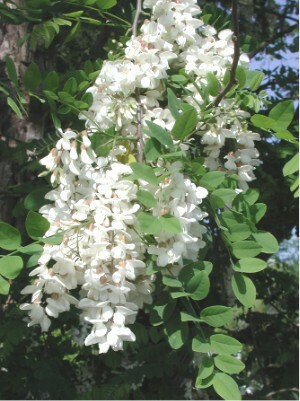 Black Locust (Robinia pseudoacacia) is fairly common in our village. When I was growing up there used to be many more than now. In mid spring the entire tree is covered with sweet scented blossoms. You used to be able to catch drifts of scent when a breeze sprung up. When the blossoms fall off it looks like it’s snowing. Don’t eat these either. So that’s four plants all with similarly shaped flowers, blooming at different times through the season, that I can count just by walking in my yard and up the road a short distance. And all have links to the main branch of the pea family. if you love pea flowers but don’t want rampant weeds, or trees, a good option is to plant perennial garden sweet peas. Lathyrus latifolius is native to Europe is an introduced plant in North America and Australia. They can reach 6 feet or more by means holding onto supports via twining tendrils, but without support sprawls on the ground. So give them the support they crave, and lots of sun. After the flowers pass, they are replaced by long, skinny pea pods that turn from green to brown. By the end of the season the pods split open and curl, flinging out the seeds. 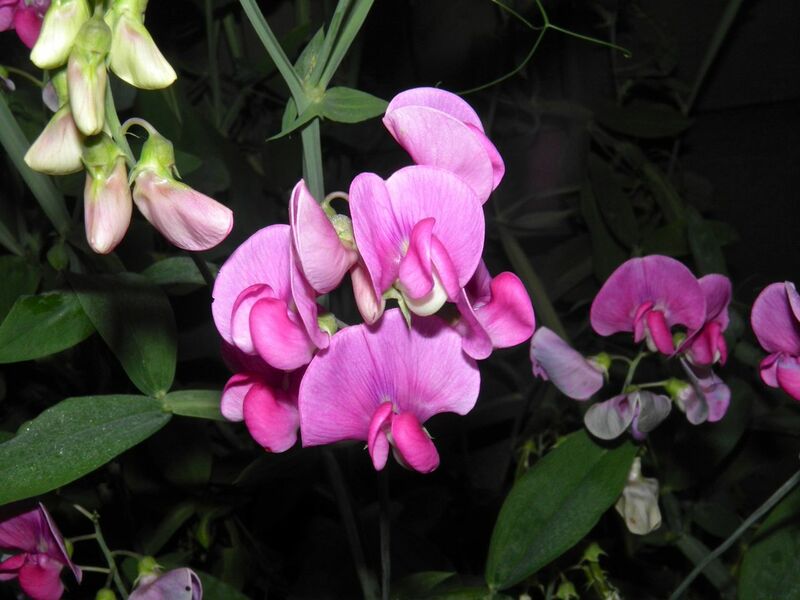 Perennial sweet peas are often confused with annual sweet pea, Lathyrus odoratus. Perennial sweet peas are not as highly scented as the annual variety, but not having to buy and plant every year certainly has its advantages. A slight disadvantage is the colour is far more limited and the scent not quite as strong. But I can live with that. The ones we have growing are beautiful. Try getting your hands on some seeds of this dependable plant. It will reward your minimal effort with a show of flowers every year.